This is my first attempt to get an almost working device to get a Secured Programmable Array Logic (PAL) Device being dumped. 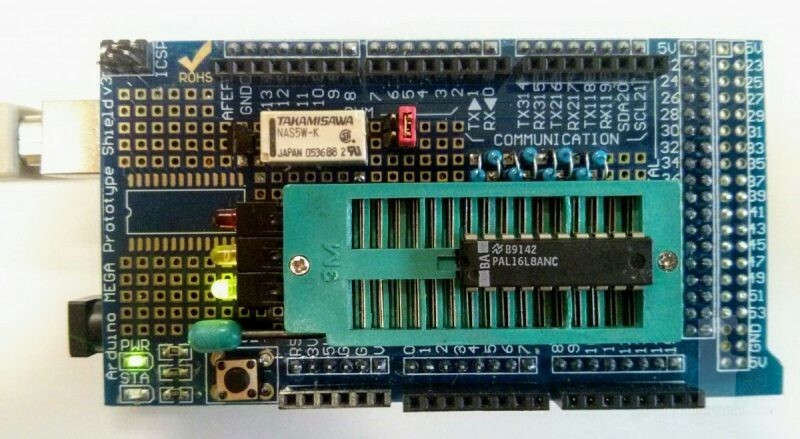 The project works with an home-made custom shield for an Arduino Mega with a proper software programmed into that toggles HIGH an LOW states on input pins and read the device outputs. In this way the resulting truth table can be analyzed and reduced to equations applying some magic … and math … LOL! dump device – start dumping selected device. d device – start dumping selected device (same as dump). list – display the list of supported devices. Checking Device on Socket … Device Present. TRUTH TABLE : 1024.00 Entries. Job done in 7 secs! Once the PAL device has been read you can submit its truth table to Logic Friday software for some reductions and calculations, so with the help of few software tools you can produce a good JED fuse map file ready to be burned on a compatible PAL/GAL device.